NEW: Sen. Obama: "I am thrilled and honored to have Sen. Clinton's support"
WASHINGTON (CNN) -- Sen. Hillary Clinton formally ended her presidential campaign Saturday, saying to a packed house of thousands of supporters, "I will continue to stand strong with you every time, every place and every way that I can." 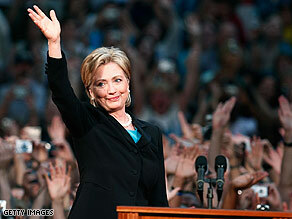 Sen. Hillary Cllinton thanks her supporters Saturday in a speech in which she endorsed Sen. Barack Obama. She urged the cheering crowd to support Illinois Sen. Barack Obama, the presumptive Democratic nominee, in his bid for the White House, saying she and supporters should "take our energy, our passion and our strength and do all we can to help elect Barack Obama ... I ask all of you to join me in working as hard for Barack Obama as you have for me." Her endorsement was met with a scattering of boos and thumbs downs from the crowd at the National Building Museum in Washington. Shortly after the speech, Obama released a statement praising Clinton's presidential run. CNN examines the two nominees for president. Who are they, and how do they plan to get elected? "Obviously, I am thrilled and honored to have Sen. Clinton's support. But more than that, I honor her today for the valiant and historic campaign she has run. She shattered barriers on behalf of my daughters and women everywhere, who now know that there are no limits to their dreams. And she inspired millions with her strength, courage and unyielding commitment to the cause of working Americans." Obama watched the speech over the Internet, a campaign aide said. He put in a call to Clinton afterward but was told by a Clinton assistant that she was speaking with supporters. "To all those who voted for me, my commitment to you is unyielding. You have inspired and touched me. You have humbled me with your commitment," she said. "Eighteen million of you from all walks of life -- women, and men, young and old, Latino and Asian, African-American and Caucasian, rich and poor, middle-class, gay and straight ... you have stood with me," she said. Clinton has battled Obama in a primary season that stretched over nearly 18 months and 57 contests, culminating in Obama's winning the 2,118 delegates needed to clinch the party's nomination Tuesday. Clinton noted that both she and Obama had made history in their campaigns. "When I was asked what it means to be a woman running for president, I always gave the same answer: I was proud to be running as a women, but I was running because I thought I'd be the best president," she said. "But I am a woman, and like millions of women, I know that there are still barriers and biases out there, often unconscious. And I want to build an America that respects and embraces the potential of every last one of us. Analysis: Why did Clinton's campaign fail? "We must make sure that women and men alike understand the struggles of their grandmothers and their mothers and that women enjoy equal pay and equal respect," she said. "Let us resolve and work toward achieving some very simple propositions: There are no acceptable limits and there are no acceptable prejudices in the 21st century in our country." "I wish she was going on the ticket instead," one supporter said. "But I think she's making a good stand down. She's a lady. She's doing it well." Clinton was accompanied by her husband, former President Clinton; their daughter, Chelsea; and her mother, Dorothy Rodham. CNN contributor Donna Brazile, Al Gore's campaign manager in the 2000 election, offered a strong message for the Illinois senator. "The work begins tomorrow for Sen. Obama to go out there, rally her supporters, earn their respect and win with them this November," she said. Clinton said that as she spoke, America's 50th woman in space was orbiting Earth in the space shuttle Discovery. If the nation can put 50 women in space, it can launch a woman into the White House, she said to loud cheers. "It is this belief and optimism that Sen. Obama and I share," Clinton said, "that has inspired so many millions of supporters to make their voices heard. So today, I am standing with Sen. Obama to say, 'Yes, we can.' "
A CNN poll released Friday shows that the party is divided after a primary season that stretched over nearly 18 months and 57 contests. Sixty percent of Clinton supporters said they would vote for Obama, but 17 percent said they would vote for Sen. John McCain, the presumptive Republican nominee and Obama's rival in the general election. Nearly one-quarter, 22 percent, said they would not vote at all if Clinton were not the Democrats' nominee. Democratic voters appear to like an Obama-Clinton ticket. A CNN poll released Friday suggested that nearly half of Democrats, 54 percent, would support a joint ticket, but 43 percent would oppose it. The poll's margin of error was plus or minus 4.5 percentage points. The Clinton camp made it widely known that she would accept the No. 2 slot if it were offered, but the push was viewed as putting undue pressure on Obama to pick his former rival. CNN's Mark Preston, Sasha Johnson, Candy Crowley, Scott J. Anderson and Ed Hornick contributed to this report.